With Smart's latest promo, you'll get a chance to win half a million pesos without adding extra efforts on joining. Mechanics is so simple. By just doing the regular procedure of Smart Pasaload you'll earn points as your entry. What are you waiting? 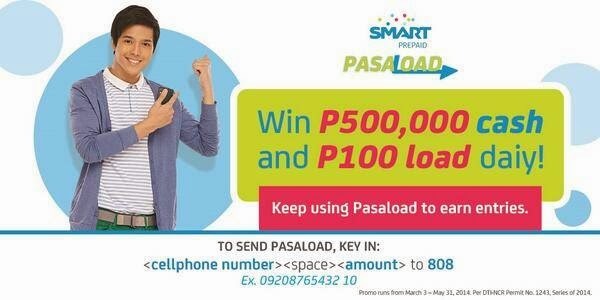 Try using Smart pasaload on sharing your load to any of your friends, love ones and family to get a better chance of being the first winner on this promo. Not just that, you’ll alse get a chance to get 100 pesos load daily. Elmo Magalona on Smart Promo poster. To share a load to another Smart number just key in the then send it to 808. For more details about this promo kindly follow SmartCares Twitter account or visit their website and Facebook account. The more successful transactions you did the more chances to become a lucky winner of the prizes offered by Smart.